An ironic mix of an economy-based city-building strategy and turn-based combat in our world after a flood. Graphics for this game were created by Owl Studio. «Whoareyou» is a gamified English language course. Our designers created unique characters together with a complete set of graphics specially for this project. On Saturday, January 19, we welcome Alexander Ryzhkin to give a presentation on "Anatomical transformation in drawing game characters". 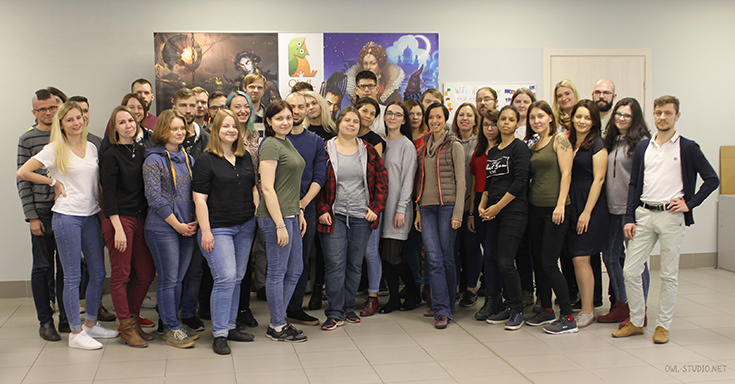 On Saturday, 15 December, Marina Mosolova — a 2D artist and illustrator from game developer King — will give a presentation in our studio. The topic is "Everything an artist needs to know about mobile games". Our CEO and Art Director will speak on the topic of marketing illustrations. This Saturday, 10 November, Jama Jurabaev will host a workshop at OWL Studio, on the topic of VR and 3D for artists! This Sunday, 28 October, Oleg Toropygin will hold a presentation and a workshop in our studio on the architectonics of the human body. The Casual Connect conference will be held between 1-3 October in Belgrade. OWL Studio at "Trojan Horse was a Unicorn"
One of the most creative art events will take place in Malta this year! Tomorrow our CEO Vera Velichko will make a presentation at the conference! Chapter 5 of One Day in London is now available in the App Store! The final part of the mysterious visual novel One Day in London is now available on iOS devices! One Day in London Chapter 5 — soon on iOS! We have a lot of game news! One of them - One Day in London Chapter 5 is soon to be released on iOS. On Saturday, 18 August, Erzhena Mishkina, a teacher at Scream School and ArtNest, will be our guest! On Saturday, 28 July, Dmitry Gladilin, Art Director for Game Insight, will join us to give a presentation! Hi there! Our studio is about making games for different platforms and doing all kinds of graphic outsource. The core team lives and works in Moscow, but distance is no restriction for true enthusiasm, and we also work with skilled professionals from Ekaterinburg, Kemerovo and Thailand. It all started at the end of 2014, when we, a group of developers, had the same idea: the time was ripe to work on our own projects. We all had a long story in game development and were equally passionate about our work, so we just united our efforts. Our ambition was to create games to be proud of, games to attract attention, games worth spending a lot of time on them. OWL-studio is also a publisher, ready to share its knowledge and resources with young and resourceful teams. If you believe in your project and want to see it through, contact us, and may be we will help you on your way! from different countries: Russia, Ukraine, Latvia and Thailand. We also gladly hire freelancers and achieve outstanding results. OWL is looking for talents!